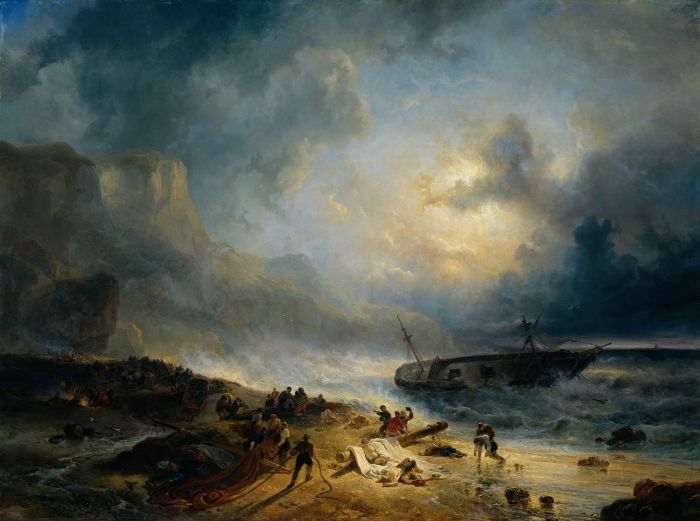 In this intensely dramatic painting we see a three-master sinking off a rocky shore in a tearing gale. The main mast lies shattered on the beach where the crew have also sought refuge. Here and there we see people lying exhausted, injured, unconscious or dead. The survivors are doing their utmost to save what they can. On the right a man has managed to haul one of the shipwrecked crew from the water. On the left people are warming themselves by a fire. Breaking through the clouds, the sun casts a harsh and eerie light on this macabre spectacle. Wijnand Nuyen painted this work in 1837. It is not a depiction of some historical occurrence. Nuyen has painted a spectacular fantasy landscape, the main theme of which is the insignificance of humans faced with the forces of nature. SPECIAL NOTE : The painter will make the reproduction as close to the original oil painting as possible. If you want your painting to alter from this likeness, please email us and " Shipwreck on a Rocky Coast, 1837 " will be reproduced according to your special requirements.